Researchers from MIT and Harvard Medical School have developed a biocompatible and highly stretchable optical fiber made from hydrogel — an elastic, rubbery material composed mostly of water. The fiber, which is as bendable as a rope of licorice, may one day be implanted in the body to deliver therapeutic pulses of light or light up at the first sign of disease. The researchers say the fiber may serve as a long-lasting implant that would bend and twist with the body without breaking down. The team has published its results online in the journal Advanced Materials. Using light to activate cells, and particularly neurons in the brain, is a highly active field known as optogenetics, in which researchers deliver short pulses of light to targeted tissues using needle-like fibers, through which they shine light from an LED source. Zhao’s group at MIT, including graduate students Xinyue Liu and Hyunwoo Yuk, specializes in tuning the mechanical properties of hydrogels. The researchers have devised multiple recipes for making tough yet pliable hydrogels out of various biopolymers. The team has also come up with ways to bond hydrogels with various surfaces such as metallic sensors and LEDs, to create stretchable electronics. The researchers only thought to explore hydrogel’s use in optical fibers after conversations with the bio-optics group at Harvard Medical School, led by Associate Professor Seok-Hyun (Andy) Yun. Yun’s group had previously fabricated an optical fiber from hydrogel material that successfully transmitted light through the fiber. However, the material broke apart when bent or slightly stretched. Zhao’s hydrogels, in contrast, could stretch and bend like taffy. The two groups joined efforts and looked for ways to incorporate Zhao’s hydrogel into Yun’s optical fiber design. Yun’s design consists of a core material encased in an outer cladding. To transmit the maximum amount of light through the core of the fiber, the core and the cladding should be made of materials with very different refractive indices, or degrees to which they can bend light. Happily, they found that Zhao’s hydrogel material was highly transparent and possessed a refractive index that was ideal as a core material. But when they tried to coat the hydrogel with a cladding polymer solution, the two materials tended to peel apart when the fiber was stretched or bent. To bond the two materials together, the researchers added conjugation chemicals to the cladding solution, which, when coated over the hydrogel core, generated chemical links between the outer surfaces of both materials. “It clicks together the carboxyl groups in the cladding, and the amine groups in the core material, like molecular-level glue,” Yuk says. 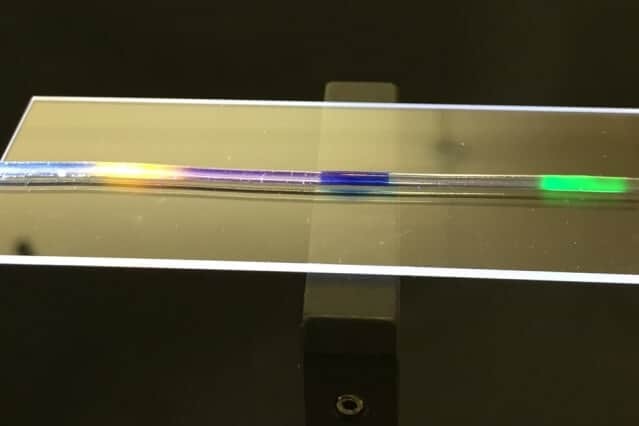 The researchers tested the optical fibers’ ability to propagate light by shining a laser through fibers of various lengths. Each fiber transmitted light without significant attenuation, or fading. They also found that fibers could be stretched over seven times their original length without breaking. Now that they had developed a highly flexible and robust optical fiber, made from a hydrogel material that was also biocompatible, the researchers began to play with the fiber’s optical properties, to see if they could design a fiber that could sense when and where it was being stretched. They first loaded a fiber with red, green, and blue organic dyes, placed at specific spots along the fiber’s length. Next, they shone a laser through the fiber and stretched, for instance, the red region. They measured the spectrum of light that made it all the way through the fiber, and noted the intensity of the red light. They reasoned that this intensity relates directly to the amount of light absorbed by the red dye, as a result of that region being stretched. In other words, by measuring the amount of light at the far end of the fiber, the researchers can quantitatively determine where and by how much a fiber was stretched. “When you stretch a certain portion of the fiber, the dimensions of that part of the fiber changes, along with the amount of light that region absorbs and scatters, so in this way, the fiber can serve as a sensor of strain,” Liu explains. The researchers imagine that such stretchable, strain-sensing optical fibers could be implanted or fitted along the length of a patient’s arm or leg, to monitor for signs of improving mobility. Zhao envisions the fibers may also serve as sensors, lighting up in response to signs of disease. This research was supported, in part, by the National Institutes of Health, and the Department of Defense.